I was recently approached by "Idiot the Wise" a.k.a. "Inspire" for an art trade. I was definitely honored to be sought out by ITW. To say he's a street art advocate would be an understatement. 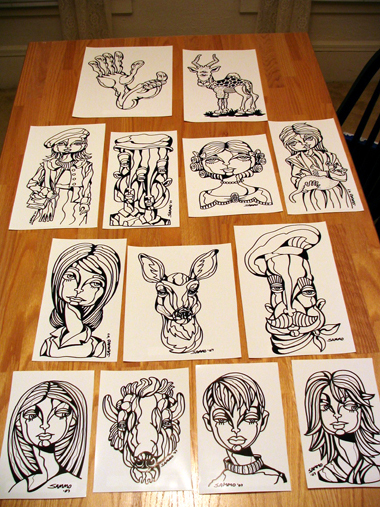 In addition to a pirate painting, I'll be sending this batch of Sharpie drawings to be placed in public places around Jerusalem (where ITW lives). Hopefully, I'll receive some photos of where some were placed. Much love Sammo! Still workin' on those collaboration pieces!